For anyone who is serious about running a business in 2018, it’s vital that you learn the power of outsourcing. Today, there’s simply so much that has to be done to run a business. This means making sure that you have ample time and experience on-hand to push everything forward in the right direction. For example, one thing that has massively changed in the running of a business is how you handle customer inquiries. In the past, people would be happy to accept that the person answering the call just barely knows the basics of phone etiquette, which means that a lack of professionalism, a less than formal attitude, or a showcasing of emotion wasn’t taken so seriously. Nowadays, when someone calls your business, they expect an erudite, friendly voice – regardless of why they are calling you. For people who are running a business in Brisbane, Australia, have you ever considered outsourcing your phone calls by hiring a live answering service in Brisbane to make things easier for you and your team? If you don’t have someone on-site who can do this job for you every day, then getting a Virtual Receptionist is the smart choice. By forcing your staff to answer the phone all day and act as a receptionist, they are missing out on other elements of their job that has to be taken care of first. Multitasking is a common problem that limits a lot of people from being able to get the job done. It means missing out on sales if you don’t have a person on the phone that is a pro, or it means missing out on productivity as you have someone only answering the phone. It’s a major part of business management, and often times hiring a receptionist is out of your price range. Simply put, it means hiring another member of staff to come in on a full-time, five-figure salary; this means that it’s very hard for you to afford that and give the benefits at the same time. 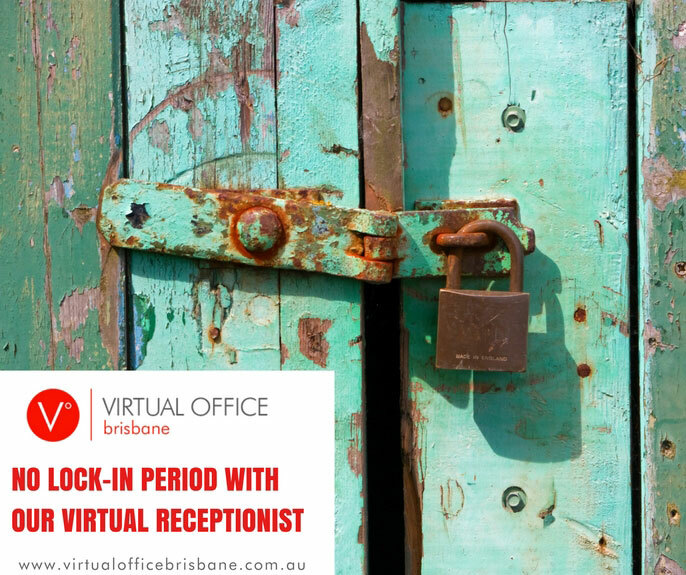 One of the most common solutions to help solve this is to turn to a Virtual Receptionist in Brisbane. If you do this, you can make sure you have someone answering the phone in a professional manner as and when you need someone to do so. This can have a hugely positive effect on the way that your business operates and runs itself. A live answering service is a professional business that answers the phone on your behalf. It’s a service that takes your calls, set up appointments for you, and providing technical guidance when possible – usually by following a script or scenario plan. With an answering service, you make sure that you have someone on-hand to answer the phone for you all day in a courteous and professional manner, which ensures you make the right impression every time. If someone calls your business and they get you mid-way through eating your lunch, or in the middle of a job, you’ll make a negative impression immediately. This will not only make it much harder for you to get that person to trust your business, and it likely puts an end to your chances of converting that person from being a potentially interested party into becoming a long-term customer and user of your business. This obviously has a majorly negative effect on your business over time, which is going to cost you a lot of time and money if you keep losing calls due to making a poor first impression. 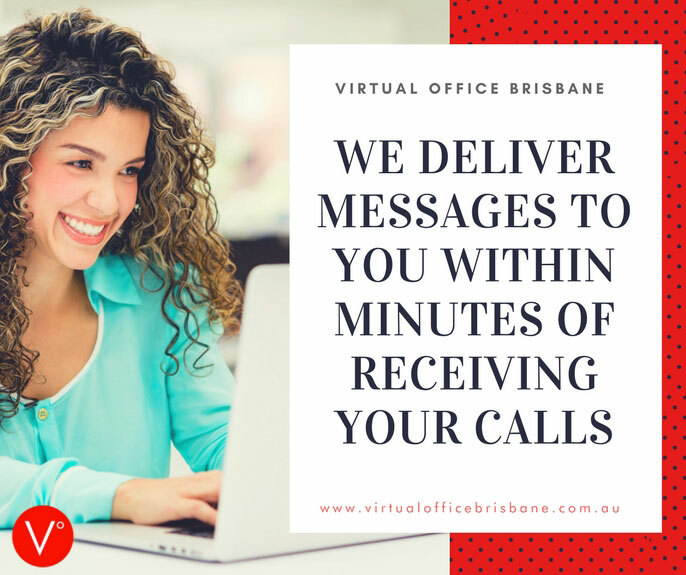 With a Virtual Assistant in Brisbane, your customers get to enjoy a much more open-minded, friendly, and endearing phone call experience every time they give your number a ring. You will find that people feel much easier talking to your business if they call up and get someone on the other end of the phone who’s friendly and cheery! It also allows your calls to get answered right away. Instead of letting the call linger in the background, you can make the right kind of impression. This allows you to get the call covered, making sure that you never see a potential client head off to your competition. With the right movement, you can make a huge difference to the way that you work and your business comes across. If you do this right, you can make a huge and positive difference to the way that your business operates; and if you keep working with this kind of manner, then you can start to pick up more calls, make the right impression, deliver a sturdier customer support service, and just make sure that you make the correct impression. That can be much more beneficial than you might expect. Hiring the right telephone answering service in Brisbane really makes a huge difference, vastly improving your operational efficiency. How Can a Live Answering Service Help Your Brisbane Business? • Stand out from the rest. For one, your business is no longer just one of the crowds. By being able to put across a more professional voice and tone, you can make the right impression time and time again. This not only allows you to make your business sound more professional, it also ensures you immediately stand out from what your competitors do. • Build and maintain trust. Another key reason why this kind of service works so well is that it allows you to build up a more trustworthy experience for your clients. They are much more likely to feel comfortable talking to a professional voice on the other end of the phone, making it much easier for you to make the right kind of impression without having to force the issue. Now, instead of needing your “phone voice,” you can handle calls with simplicity. • Create a brand image. When people are used to seeing your business pick up the phone and have a polite, professional voice on the other end, they’ll get used to that. It helps to create that tone and image that allows you to come across as a friendly, welcoming and interesting business. Instead of a different voice that may lack the professionalism answering the phone each time, people will be used to hearing someone who they get used to hearing. • Longer calls. When you get someone on the other end of the phone who answers quickly and professionally, you immediately get the attention of the caller. They are much more likely to stick around on the other end of the phone when they feel like the person they are talking to is able to give them a message worth hearing. Instead of letting them leave a message on the voice mail, you’ll be able to make sure that the message is heard and passed on to the right person. • Clearer messages. With a professional expert who is great at getting the right message from the caller, you can get a much more accurate information from your customer. This allows you to easily avoid wires getting crossed, and ensures that the message being delivered is the same one that was asked for. This helps to improve customer support and makes providing solutions to the problems they face so much easier than before. • No delays. Instead of having someone floating around on the line (where they are likely to hang up), you can get people answered and spoken to immediately. A live answering service is much more likely to be able to get to the call quickly and ensure that a plan can be put in place to help avoid delays. Now, customers and callers will have their queries dealt with in a timely manner, making your business come across as more professional. • Add value. Your customers will be able to enjoy a much more seamless, enjoyable calling service if you can give Brisbane live answering service a try. They feel more valued as you have someone there to immediately answer their questions, instead of leaving them with whoever can be bothered to pick up the phone. This makes customers feel more important, giving them a more personable and friendly service to help them solve their problems. • Fewer issues. The other key issue that you can benefit from when using this kind of service is that you will have fewer communication problems. With most live answering services, you can get multilingual experts answering the phone, reducing the language barrier and making sure that solutions can be sought and enjoyed in the shortest space of time possible. 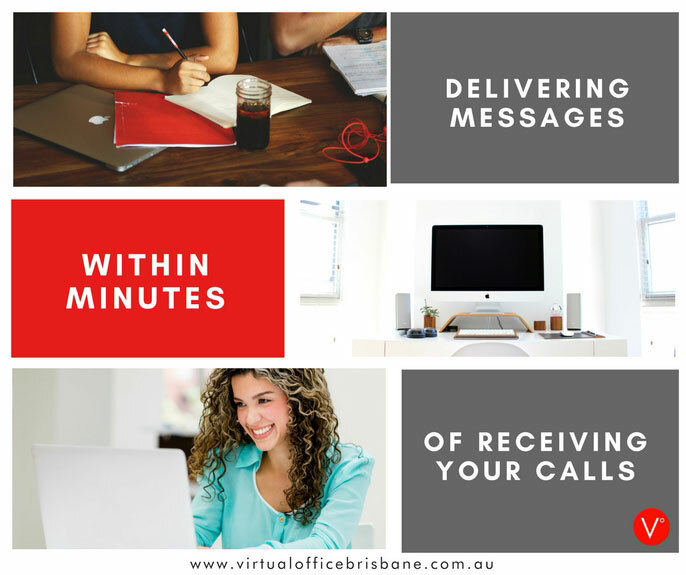 Learn more about Virtual Office Brisbane by visiting the blog page of this website. Also, one particular write up that would provide you with all the information needed to help you decide whether you need a virtual help or not is an article titled “A Guide to Choose the Best Phone Answering Service in Brisbane, Australia". Is a Live Answering Service in Brisbane Worth the Investment? If you were to hire a phone answering service in Brisbane, you pay a set fee per month. It’s usually based on making sure you have an adjustable package; the kind that allows you to get X calls per month handled at Y price per call. The more calls you buy, obviously, the less it is per call. With this kind of metric, you can scale up and down as time goes on. Rather than having to spend all of your time looking around for someone who can handle as many calls as you need, the package can be adjusted. You can start with something small and step it up as the need arises. However, if you were to hire an in-house receptionist, that would be a huge expense. You would need to be paying them a part-time or full-time wage, usually in the high four to five-figure ranges. That’s a huge investment for most businesses, and often might be totally out of your price range. If you add in the cost of a receptionist to the discussion, it’s easy to see why it might not be a good option. In addition, a live answering service works better if you also get a 1300 number in Brisbane as well, which allows you to keep the same number for the life of your business. While an in-house receptionist can do more for you than just answer the phone, it’s often the primary job that you need them to deliver. If you hire an answering service, that immediately changes. You have someone to handle the calls for you, meaning that you are paying a much-reduced rate – even on the most advanced package, you would be paying far less per year than you would be for a receptionist to work as part of your team. That should make it easy for you to see why this is worth the investment on your part. Still not convinced? Then you can usually enjoy a one-week trial to see just how this kind of service helps to promote your business and help it receive and get business through calls. Where Can I Find a Live Answering Service Provider in Brisbane? 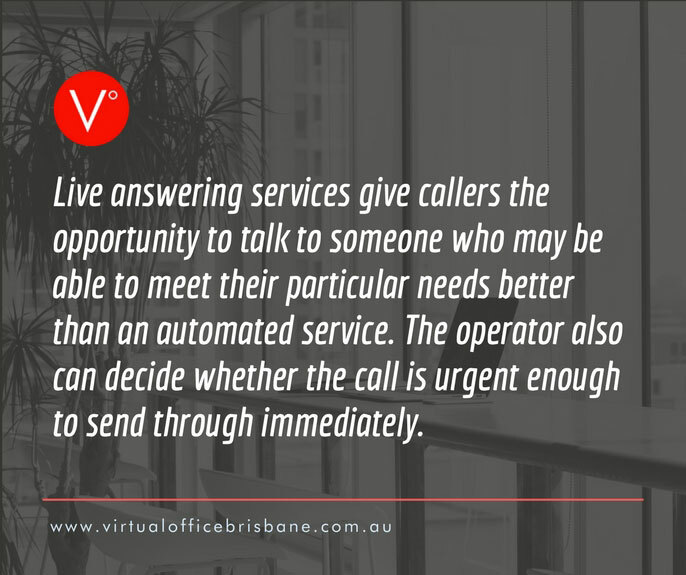 Upon checking all of the benefits that you can get from outsourcing your phone call, you should find it easier to know why you should get a live answering service in Brisbane. The challenge now is to find the right service for you. One of the most popular across the nation is Virtual Office Brisbane. Serving over 4,5000 happy customers, it’s easy to see why so many turns to the world of live answering services to help handle and manage their business from this perspective. Done right, this can have a wholesale effect on the way that your business operates itself. With the right team behind your calls, you can enjoy a much more specific form of message coming from your business. Instead of having someone else answer the phone every time, starting fresh with every customer, hire a business that can help to build uniformity and personal engagement with every caller. This can have a huge positive effect on your business. If you are serious about making a difference to the way that your business operates, then you should consider investing in extra help in the form of a phone answering service. 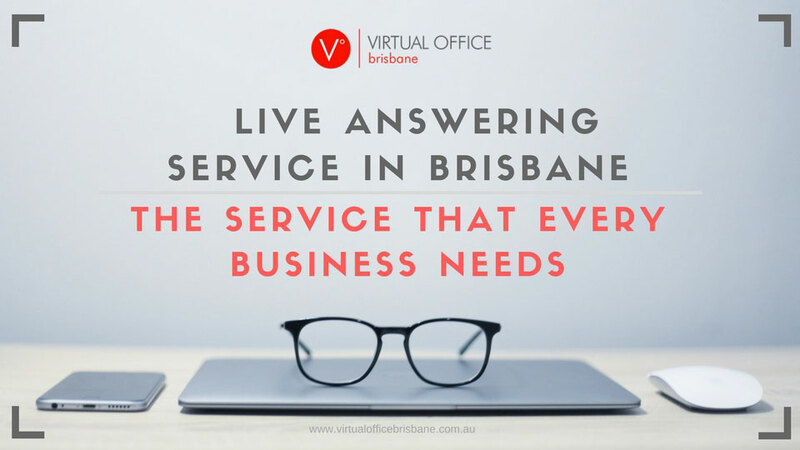 If you’re a company who wants to start a business in this city, you can even use a virtual address in Brisbane together with your live answering service in order to capture walk-in clients as well. Trust us when we say it could be the smartest decision that you make; an absolute must-have for so many reasons. With so much competition in every industry, why settle for second place? Go a step further with a live answering service starting today.